Just let that sink in a little while. Our third snow of the year fell overnight. In recent years, we have often been lucky to get that many snows in a whole winter. 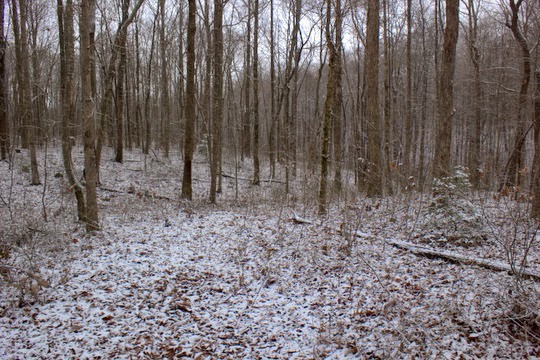 Maybe we are headed back to the deep freeze from my childhood when regular heavy snowfall was common here on the Cumberland Plateau. Admittedly this one is more of a dusting and my friends from Colorado are probably chuckling as they ski in deep powder high in the Rockies. Still, it is snow and we take every little bit we can get. 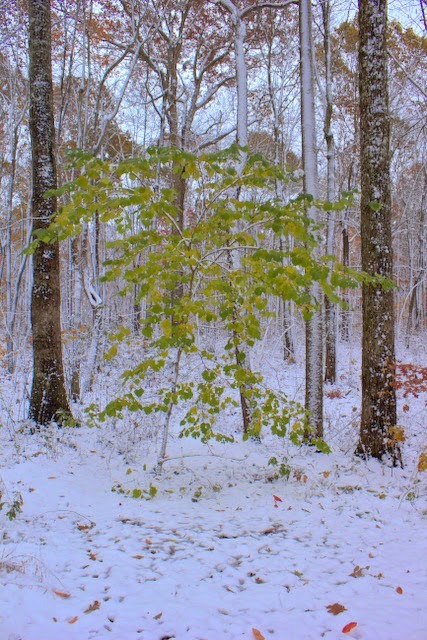 The woods are beautifully decorated with just enough snow to make the scenery interesting without actually completely covering everything in white. The muted tones of winter blend with the white to make a rather enjoyable scene. 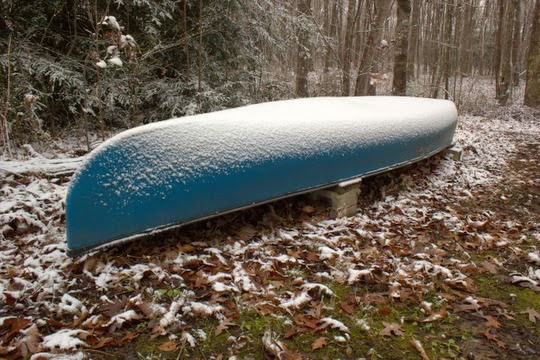 My poor canoe is shivering under a thin layer of the white stuff. Probably right now it is wishing for another trip to the Everglades where at least it would be warm. In fact, I'm thinking about another trip that way, this time with a lot more fishing involved. So far nothing has been decided but the possibility is definitely intriguing. 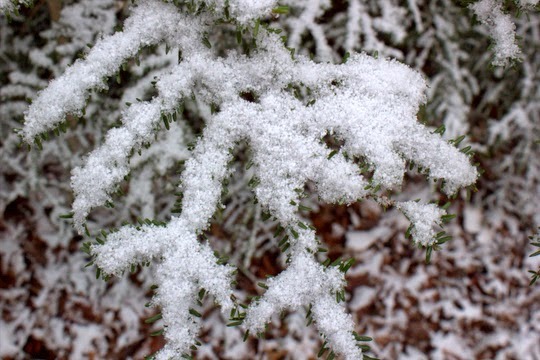 The hemlock trees have collected more snow than some of the others, mostly because they have somewhere to collect all that white goodness. The birds are strangely absent although that may have more to do with the fact that I still need to put out some seed on the feeders. Occasional snow flakes are still falling but I doubt we'll see any more accumulation. Each year, it seems, we get snow on Thanksgiving. Most years it is just a few flurries, but they are there nevertheless. Each year, I am thankful for that snow, mostly because we never have as much as I would like (yes, I definitely miss Colorado). This year, in addition to the snow, I am thankful for friends and family, good health, and the opportunity this year to do something that I love. Guiding has been an incredible journey thus far, and I have been blessed far beyond what I expected in my first season. Yes, there have been a lot of difficulties over the past year, but life goes on and I'm thankful for all the blessings I have. I hope everyone has a great Thanksgiving today and maybe can even get out in the next couple of days to wet a line. We are getting pretty low on time to do that this year so enjoy it while you can! On most of my camping trips I like to document the camp a little with my camera. Sometimes I just snap a few shots of the overall setup and other times I go to great lengths to get shots of everything that makes up camp life. Fire shots in particular seem to get me snapping more pictures than I intend. Fire is just so mesmerizing that I'll often shoot 50 or more pictures before I think, "Oh man I can't fill up my memory card with fire pictures!" Last month in Cataloochee, I found myself taking the obligatory camp shots but not really dealing with the fire thing on the first evening. My cousin would not show up until the next day and a campfire is generally best when it is shared with someone else. My fishing plans for the next day included a stream I had never fished but wanted to give a fair shot so I did a quick supper before hurrying to bed. 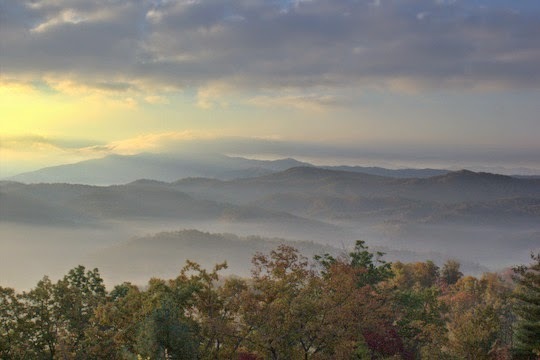 The trip to Big Creek was actually more of a break on my trip to Cataloochee. Of course, I had planned it in such a way that I got to Big Creek early in the day. Exploring new water is frustrating when you are limited to just an hour or two so I kept the whole day wide open. 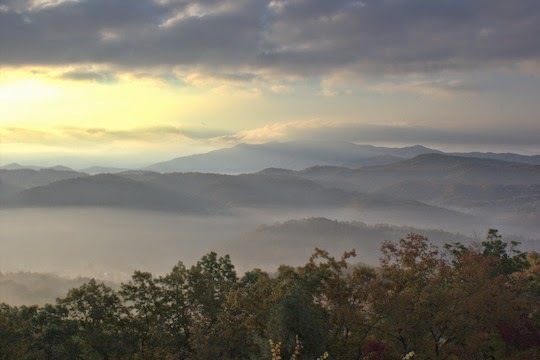 By mid afternoon, the thought of getting camp set up before dark had me back on the road. 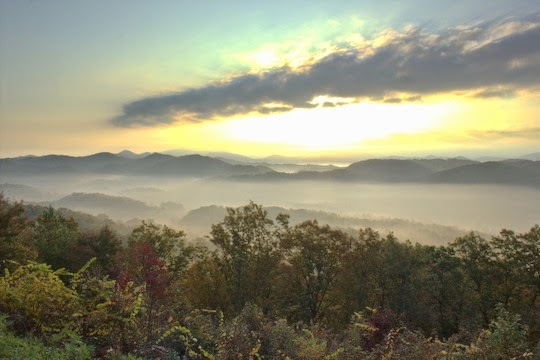 Driving from Big Creek to Cataloochee is always an adventure. These gravel roads seemingly go on and on indefinitely. Then, just about the time you are wondering if you will ever get there, you start noticing some familiar landmarks. As it turned out, I not only made it there in time to set up camp before dark, I also had enough daylight left to catch some fish. There is one pool in particular that I love to fish, mostly because it is easy to access and can be fished effectively without putting on any wading gear. Never mind exactly where because I would rather not have others fishing there. Selfish I know. I still had a large orange October Caddis pattern tied on and stuck with that. Why change when a fly has been catching so many fish right? Starting out about halfway up the pool, I started covering the water carefully. The fish were there, I was sure of that, but for some reason or another, I wasn't even getting any looks. By the time I started casting in the fast water at the head of the run, I had lost a considerable amount of hope for this spot, but then on the 2nd cast to the fast water there was a subtle swirl and the fly disappeared. When I set the hook, chaos ensued. These chunky rainbows were both larger and stronger than I expected. Soon after catching the first, I caught another, and then another. All from the same little seam at the head of the pool. That spot was good for 5 nice rainbows in a matter of maybe 7 or 8 minutes. As soon as the action died down I quit for the day. I was already feeling a little greedy after pulling enough trout out that the nearby tourists were taking notice and figured that it would be better to just let the other fish take the rest of the day off. 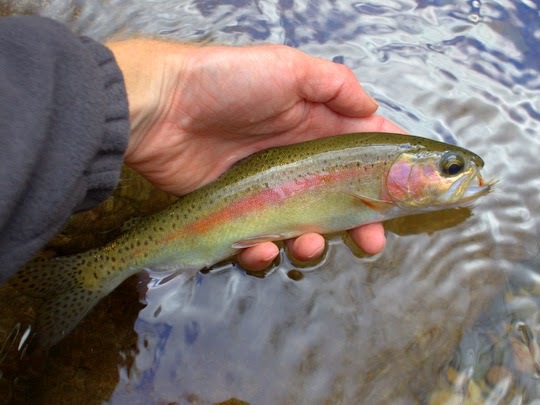 Don't forget to sign up for the Trout Zone newsletter. You can do so using the form below. Your email address will only be used to send out the newsletter which will contain fishing reports, tips and tricks, photography, and occasional special offers and giveaways. This time of year is pivotal for the brown trout populations on the streams that support wild, self-sustaining populations. One of the biggest mistakes that I see made by other anglers is wading through the areas that have been recently spawned. I'm not going to get into the ethics of fishing (or not fishing) for spawners as everyone seems to have pretty strong opinions one way or the other and I'm not interested in starting up that debate on here (but maybe over on the Facebook page for the Trout Zone). The one thing we should all be able to agree upon is that it is a terrible idea to wade on the redds where the eggs have been recently laid. This past week, on two consecutive days when I had guide trips, I saw people fishing a popular spawning site for the browns in the Great Smoky Mountains. The unfortunate thing about it was that they had waded out on the gravel where the fish have been spawning to get a good cast at some fish they had spotted. If you have very sharp eyes and can spot the redds and wade around them, then I guess we are back to everyone making their own ethical decisions. The unfortunate reality is that most people have a tough time identifying redds in normal years, and this particular year is anything but that. You see, we had a high water event that bordered on a minor flood only 3 or so weeks ago. 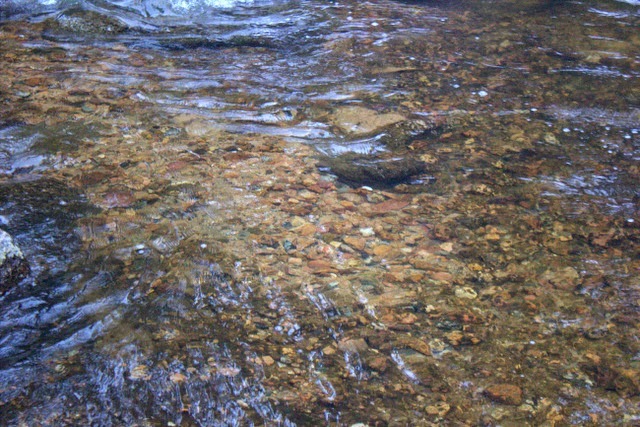 It cleaned all of the gravel in the streams of the Smokies to the point that now it is close to impossible to determine where the fish have dug out their nests. 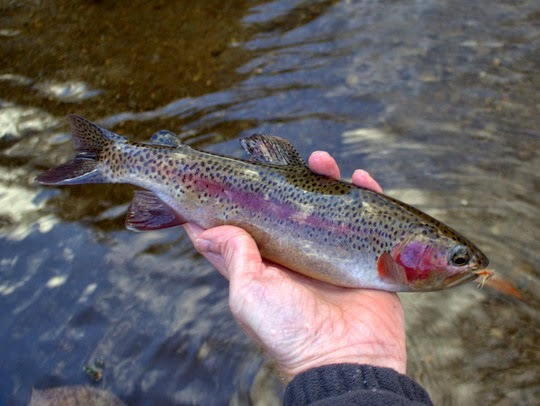 That means that wading through a known spawning area (or any gravel area where you have spotted fish holding on or near) is likely resulting in the loss of the next generation. The best solution? Stay away from the small gravel in the back of pools and in the riffles. 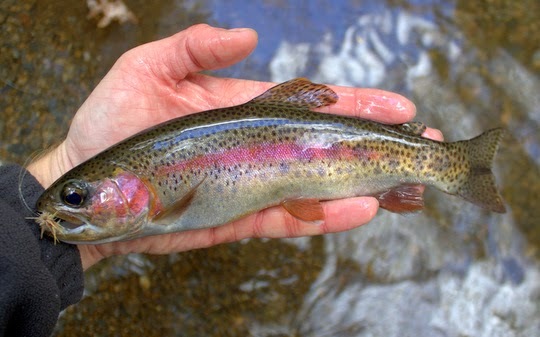 If you have spotted a large trout holding in that type of water, it is probably on a nest and should be left alone. Above all, when it spooks 30 feet upstream, don't wade out on the gravel it just vacated to try and cast to it. There were probably eggs there that you are crushing. Here is an example of a normal redd when high flows have not scoured out the stream recently. The difference this year is that all the gravel is the same color as the cleaned area in the middle so again, it is nearly impossible to identify redds unless you have a very keen eye. If you must fish the Park during the next 2 months, please at least stay away from gravel areas like this. The really good quality gravel is not in as great a supply as some think and the fish need a good spawn to contribute towards future generations of big wild brown trout. To wrap up, here are a couple of pictures from a few years ago that will look familiar to those who have been following this blog for a while. 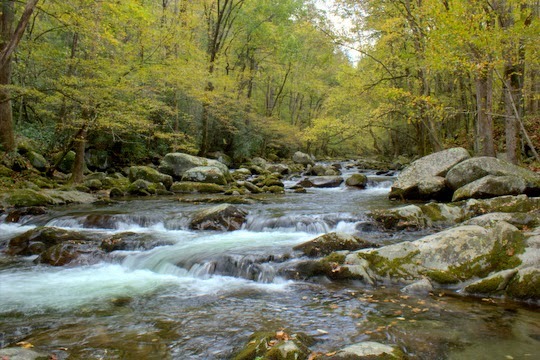 These are large spawning brown trout in the Smokies. With the cold season now upon us, I'm looking at ways to stay busy through the winter. One thing I haven't done yet that is long overdue is to start a Newsletter that will include things like fishing reports, special offers on guided trips, fishing tips, and the usual photography you have come to expect here at the Trout Zone. Of course I will not ever use your email except to send the occasional Newsletter so you don't have to worry about spam when you sign up for the Newsletter. To get started, use the sign up below. 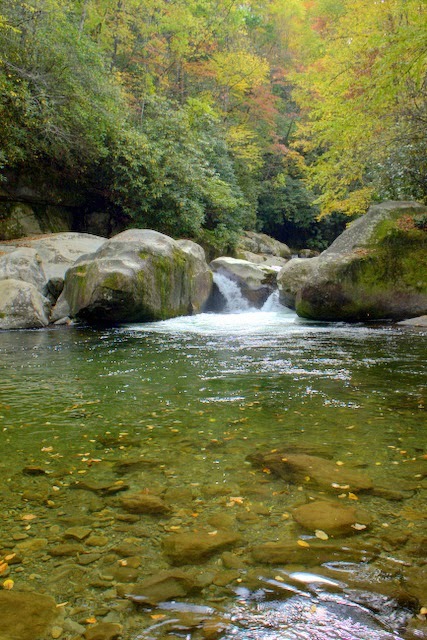 While I generally feel like I know the Smokies pretty well, there are still several places in the Park I haven't fished. Okay, there are a lot of places I haven't fished. After all, with hundreds of miles of fishable water, the problem is one of time and accessibility. The more accessible water is what I normally fish because I am usually low on time. One place that takes a bit of effort to get to is Big Creek. I chose the "miles of gravel road" route for my recent exploration. 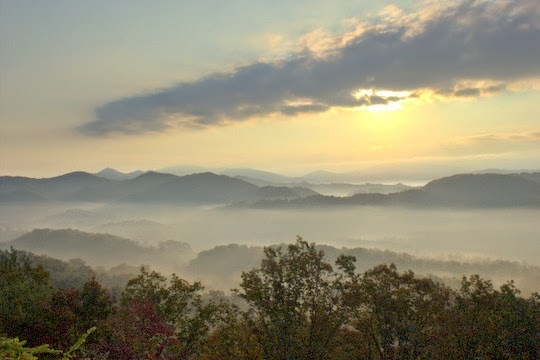 Having only passed that entrance of the Smokies once before, I was in for a treat. 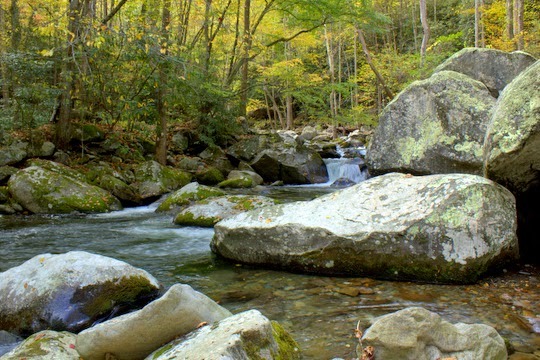 The stream reminded me a lot of other Smokies streams like the Middle Prong of Little River or perhaps even Little River proper above Elkmont, but what a wonderful little stream! No, I didn't catch any monsters or for that matter even all that many fish, but fishing a new stream is always a great experience. Each pocket, pool, and run provides the little surprises that always come with discovery. One large pool had a deep section off to the side with a gentle current running through. The surprising lack of conflicting currents meant that the cast was actually pretty straight forward. The trout were obviously holding just under the surface and were rising consistently. My third cast resulted in a fish. In another pool, I surprised myself by setting the hook. The dry had slowly sunk and I'm still not sure if I actually saw the fish or perhaps subconsciously my brain registered the swirl that was the fish taking right in the heavy current. Either way, when I set the hook the fish was as surprised as I was. Of course, these little surprises happen on my home waters as well, but there it lacks that new feeling. Most surprising of all perhaps were the large pools. Having never been there but always hoping to see it, I climbed out of the gorge right where the stream tumbles out, climbing straight up the side of what felt an awful lot like a cliff, and hit the trail upstream to the Midnight Hole. It was as beautiful as the pictures I had seen and even larger than I realized. My last fishing memory for the day was made on this pool. Trout are everywhere in that pool, but were relatively tough to fool. It wasn't until I noticed some rises against the far bank that things began to work out. Checking for trees behind me, I was soon casting the big orange Elk Hair Caddis to the boulders across from me. A nice trout ate and I managed to keep it on throughout the fight. 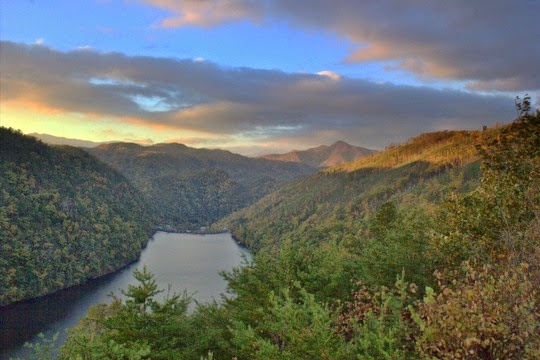 As much as I enjoyed fishing at Big Creek, I was actually on my way over to Cataloochee for 2 nights of camping and with luck would make it over there before dark to fish a little more. Soon I was hustling back down the trail, but already knew that I would be back again, even if it is a little out of the way. Tomorrow afternoon I'll be tying at Fly Tyers Weekend in Townsend. This is a big event with some of the best fishermen and fly tyers from around the country. With all the talent there I'm not even sure what I'll be doing tying. I should probably just sit back and watch. I'll be taking along the vise, tools, and materials though and will be tying from approximately 1-5 pm. As we now enter the cold months with the shortest days of the year, I'm offering winter and holiday pricing on all guided WADE trips. The fishing tends to be slower than during the warm weather, but there is a certain charm to knowing that you basically have the whole stream to yourself. Want to work on some winter techniques and brush up on your nymphing and midge skills? Contact me to set up a trip at TroutZoneAnglers@gmail.com! After an early declaration of fall, I'm also ready to make an early announcement for winter. At least the early fall announcement was merely a few days early. 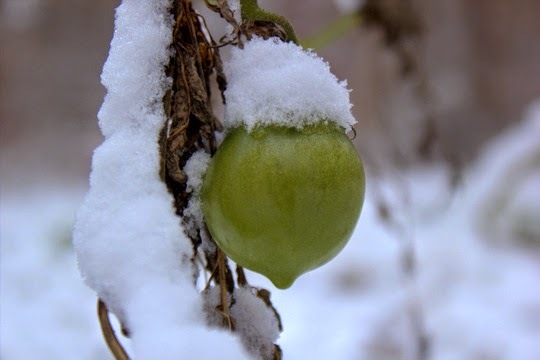 Unfortunately or fortunately depending on who you are, this winter business is starting more than a month earlier than the official start on December 21. 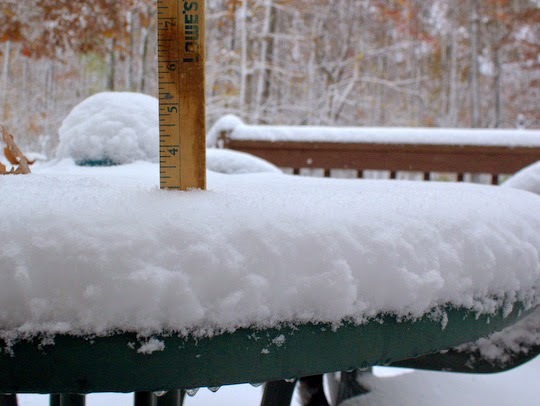 In case you need some convincing, here are some pictures from our 3 inches of snow on November 1. Oh, and this next week will feature another cold Canadian airmass with highs struggling to get much out of the 30s by late week. 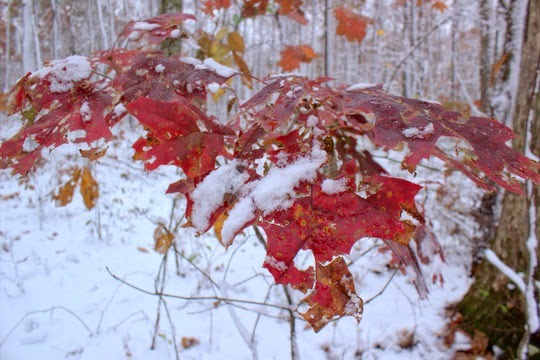 Is winter really here or just a strange fall? Only time will tell. Regardless, I'm still plotting on taking some late season fishing trips. 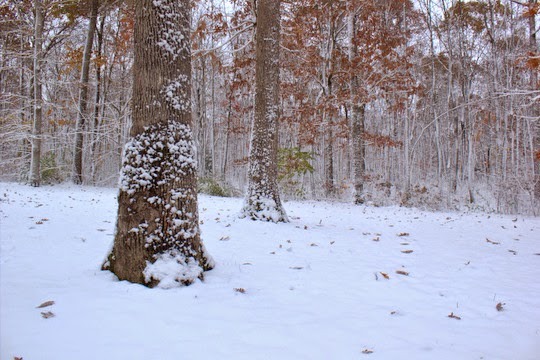 The snow was wind driven, sticking to the sides of the trees for a beautiful effect. This tomato looks like it is wearing a white hat. It just needs eyes and a mouth! Needless to say, the peppers were a little shocked. A few hearty trees were still holding on to their green outfits. 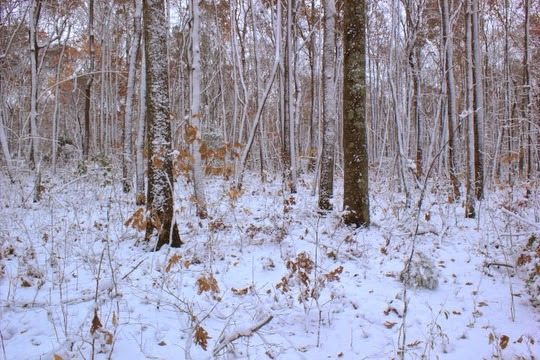 There is nothing better than a silent forest after a snow fall. 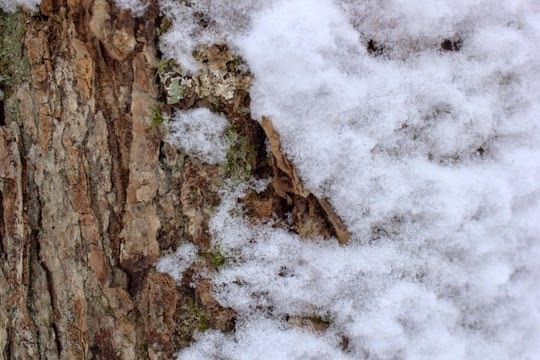 This tree had a lot of snow stuck on the windward side. 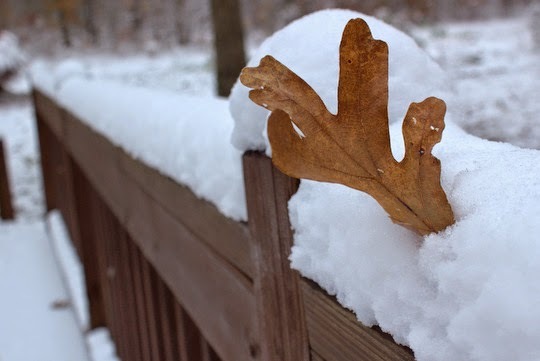 I found a leaf that had stuck itself into the snow on the deck railing.